Surveys: We Want To Know What YOU Want! We've recently posted a couple of surveys on our facebook page. Please check them out and let us here what YOU guys want to see or hear at Area 54. We're there to provide you with the experience you want, and so, instead of guessing, we decided to find out directly. Please visit the page and let us know (and if you haven't already, 'like' us there, too!). We've just made a major overhaul to the QuikTour Cocoon view sets, incorporating the newer exhibits and better views of the existing ones. The views are stunning, literally a 'trip within a trip'! Just hop in and enjoy the show; they are definitely with the visit! QuikTour Cocoons are located in the new Entry Area and within Club 54. SL Area 54 - Area 54 SL announces the appointment of Kread Fallen as General Manager of Area 54 in SL. Kread, a long-time and well-known DJ and club owner in SL, is a perfect fit for us, and we're lucky to get him. He's a very talented guy, and his enthusiasm for the Area 54 vision, not just in SL but across the metaverse and internet, shows clearly when you talk with him. Handling everything from DJ line-ups and event-planning to advising on strategy and PR with TJ, Persia, and Lap, he's the key person to go to for anything relating to Area 54. Adding him to our team is a huge plus for us, and we're looking forward to seeing our modest beginning begin to grow into a huge success with him onboard. Stop and say 'Hi!' if you see him around when you visit the build! Get Yer Bunneh Slippers at Club 54 - While They Last! Okay, after numerous inquiries and repeated requests indicating a strong interest and high demand on the part of our visitors, we've finally managed to do it: we now have a bunny slipper vendor at Club 54 so you can all get your very own pair, just like TJ's! DeeezNutz and TJ show off their kicks. Folks, these things just look damned cool, and they make an ordinary dance animation really come to life. On top of that, they have the added benefit of helping keep the dust off of the dance floors! These things are quickly becoming the standard footwear at the club, so hurry up and get yours while supplies last! The vendor is located near Quisp in Club 54, and they cost only $L200 - a tiny cost to pay for all the coolness you get, plus they are customizeable! Get yours today! BOSL Radio Celebreates 3-year Anniversary @ Club 54! 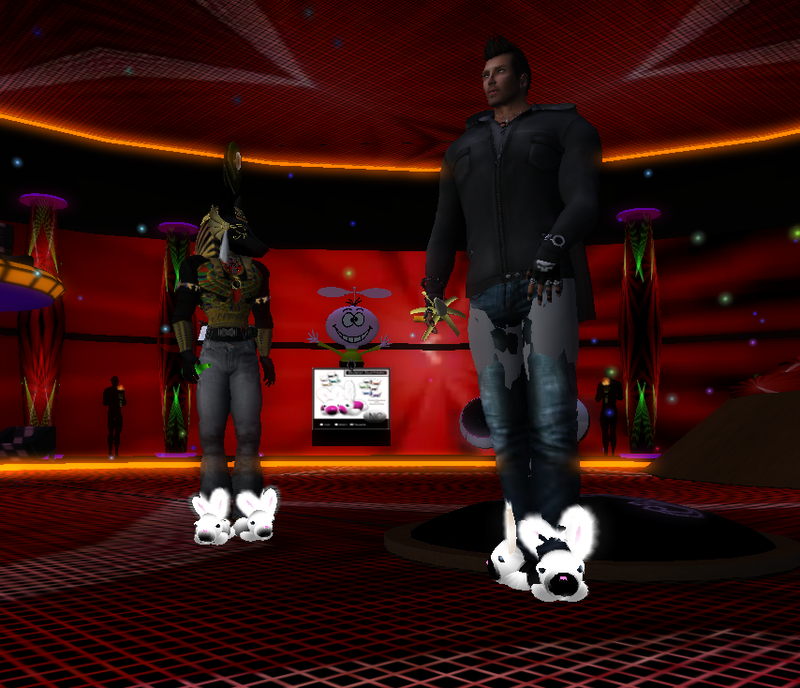 Club 54 was one of the venues in SL selected to help celebrate BOSL Radio's 3rd year birthday party on the April 16th. Hosted by Persia Bravin, DJs CottonCandy Teardrop, Diaphonia, and Anubis Beorn provided more than 3 hours of non-stop music for the 100-plus guests who stopped by to wish them well. All in all, it was a great time, and we want to congratulate BOSL Radio and those who make it great and wish them continuing success! 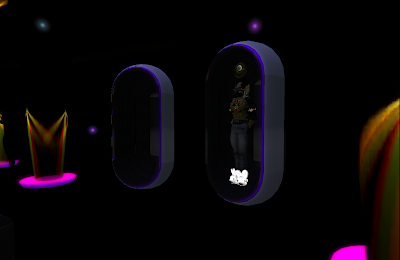 Visit Area 54 in Second Life! Click here to teleport to Area 54 NOW! requires Second Life viewer and SL account. if you don't have one yet, you can get it FREE from secondlife.com.